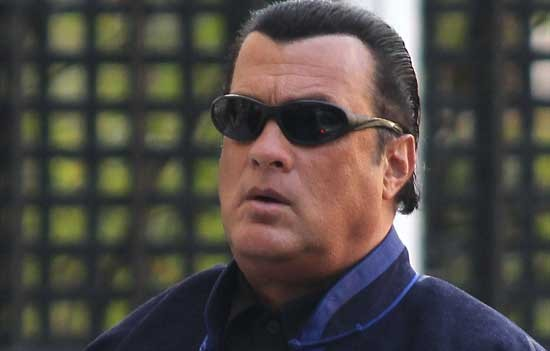 Steven Seagal has been barred from entering Ukraine after the action star received Russian citizenship. The US-born actor is one of many cultural figures to be blacklisted as fighting between Russian rebels and Ukrainian forces escalate in eastern Ukraine. The Under Siege star has “committed socially dangerous actions … that contradict the interests of maintaining Ukraine’s security,” according to a letter from the Ukrainian security service. It added that he is banned from entering the country for five years. The actor received his Russian passport directly from President Vladimir Putin in November. The Russian leader reportedly said he hoped the move would foster better US-Russia relations. He even performed at a concert for pro-Russia separatists at a biker show in Sevastopol. The actor reportedly told Russian news service TASS that he feels “very at home” in the country, though he said he has no plans to move there. <>pThe ‘90s star has recently taken to acting in and producing straight-to-video movies. According to IMDB, he has two projects in the works for 2017. Ukraine has blacklisted several other actors and musicians, including French actor Gérard Depardieu. The country released a list of 500 cultural figures they intended to blacklist in 2015, on which Mr Segal was included. <>Most recently, the country blacklisted Russia’s entrant for the Eurovision song contest – which Ukraine is hosting.